You can import item, modifier and customer into MobiPOS. Download the sample file from CMS via Web -> Add via CSV and modify them. After creating your csv file, you need to upload the file into MobiPOS document folder. You can learn how to do it by following this guide. However with CMS via Web, you can upload the file without the need plugging your iPad into a PC/Mac. Before importing item, make sure you have created all the categories needed by the item. 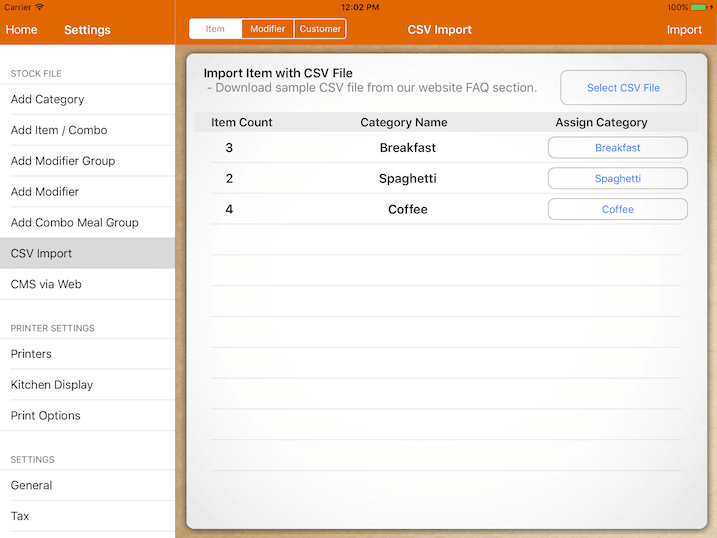 Upon selection of csv file, assign each category and import them. If the application exits, make sure your csv file is identical with the sample csv file. Open them with notepad and check the number of comma in each line.